Here’s the situation: Lately it feels like there’s always some occasion to celebrate. My daughter’s milestones, work birthdays, Junior League events…whatever it is, it calls for a sweet treat, and I rarely have time after work to go through the painstaking process of making cakes completely from scratch. But I just can’t bring myself to go store-bought—it feels really generic, and I do really love making homemade treats. Step 2: Combine all ingredients, except the sugar, and use an electric mixer to beat the mixture for 2 minutes until smooth. 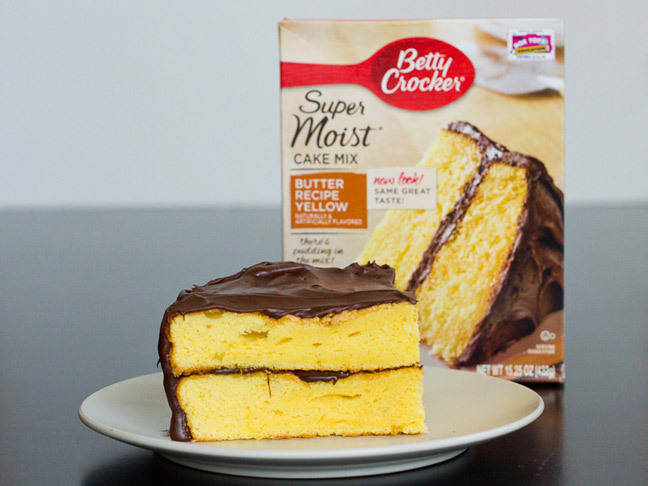 Step 3: Pour into 2 9″ oiled/floured cake rounds, sprinkle the sugar evenly over both cakes, and bake for 25-30 minutes. Step 4: Allow to cool for 5 minutes, then remove the cake from the pan and cool on a wire rack for 15 more minutes. Step 1: Beat the butter and cocoa on low until incorporated, then add the remaining ingredients and beat for 2 minutes until fluffy.